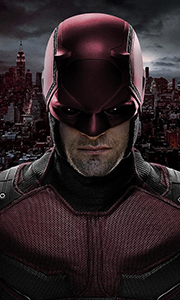 Marvel's Daredevil follows Matt Murdock, attorney by day and vigilante by night. Blinded by an accident as a child, Murdock uses his heightened senses as Daredevil, fighting crime on the streets of New York after the sun goes down. His efforts are not welcomed by powerful businessman Wilson Fisk - aka Kingpin - and others whose interests collide with Daredevil's. Though Murdock's day job suggests a man who believes in the criminal justi.. The razor-thin line between redemption and retribution explodes with a vengeance in Marvel’s Daredevil: The Complete Second Season. With Wilson Fisk behind bars, Matt thinks his efforts to bring order to Hell’s Kitchen are succeeding - until chaos reignites with two new arrivals: Frank Castle (a.k.a. The Punisher), an anguished ex-soldier determined to visit bloody, irrevocable “justice” upon his adversaries, and Matt’s volatile old fla..